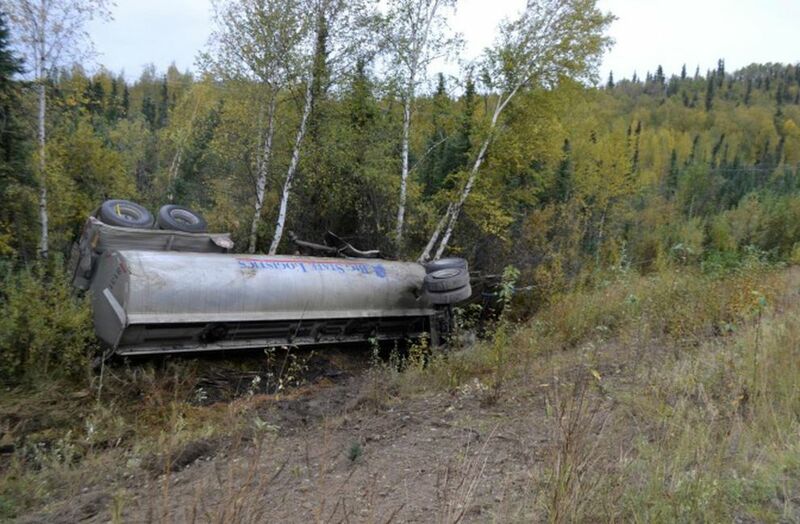 Federal and state regulators in Alaska say they're working to stem what has been a growing number of tanker-truck accidents in recent years — including three big rollovers since September that dumped thousands of gallons of diesel fuel into woods and wetlands. Residents in towns along the Richardson Highway where those and many other spills have occurred say they worry an out-of-control fuel tank will slam into traffic or damage fish habitat with a spill, including the salmon-rich Copper River with its prized fisheries. Observers blame the wrecks on factors such as warming winters that increasingly glaze roads with ice, plus less highway maintenance amid Alaska's fiscal crisis and human errors by truck drivers and other motorists. But double-tanker-truck traffic is also up since 2009, when state regulators required that ultra-low sulfur diesel be trucked to the North Slope oil fields to be used there, in line with federal regulations implemented in 2006 elsewhere in the U.S. The rules required use of the new fuel to replace diesel fuel with air-polluting high sulfur oxide emissions. In 2005, major North Slope oil producers BP and ConocoPhillips signed an agreement with the state to manufacture the newly required diesel from crude oil on the North Slope starting in 2008, in exchange for the state supporting delayed implementation of the federal requirement, according to the Alaska Department of Environmental Conservation. But in 2007, ConocoPhillips told reporters it would not manufacture the fuel on the Slope — a move requiring a costly upgrade of a small refinery there — after the state passed an oil-production tax under then-Gov. Sarah Palin. Ultra-low sulfur diesel has been produced in Alaska at two refineries, one in Valdez and the other in Kenai. Many of the rollovers have occurred on the Richardson Highway in part because fuel headed north from the Petro Star refinery in Valdez travels by that road, officials said. Ultra-low sulfur diesel shipped north from the Tesoro refinery in Nikiski can travel to Fairbanks by pipeline and railroad, reducing the need for fuel-truck hauls up the Seward and Parks highways. There have been crashes with fuel spills on the Dalton Highway as well, the remote 400-mile "haul road" that is the last stretch to the Prudhoe Bay oil fields, the destination of many full tanker trucks. Truck accidents with spills on the Dalton jumped to 15 from July 1, 2008, to June 30, 2009 — the state's 2009 fiscal year — from zero the year before, ADEC figures show. An average of eight such spills occurred annually after that on the Dalton, with thousands of gallons of fuel dumped. 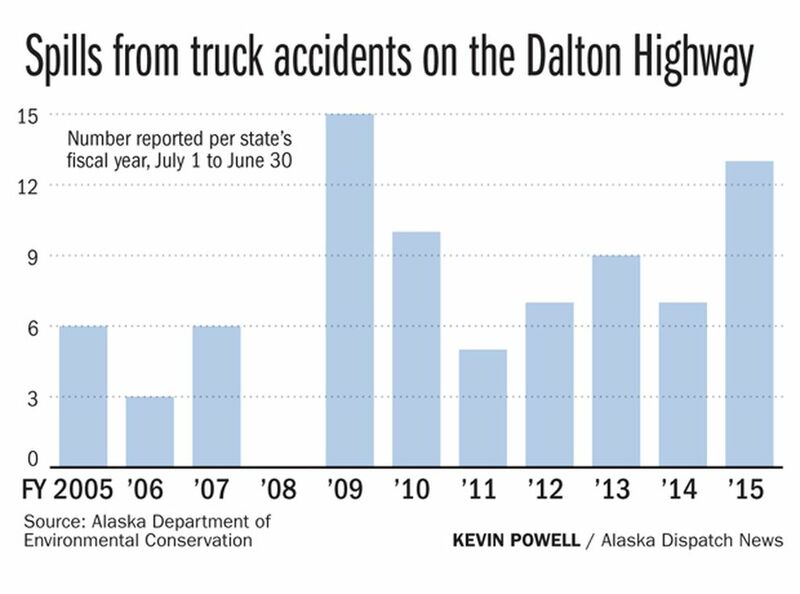 But the Dalton spills fell from 13 in fiscal year 2015 to two last year as regulators worked with trucking companies to address the problem, including at a workshop in 2015 underscoring the dangers and best practices, according to ADEC. The fuel-tanker trucks are operated by hauling companies that acquire the fuel from the refiner. They include Big State Logistics, Nana Oilfield Services, Colville and Alaska Petroleum Distributing. Those companies and others have had accidents leading to spills in recent years. Willard Hand, a tribal environmental officer with the village of Tazlina south of Glennallen, said he drives toward the shoulder when he sees the double-tanker trucks approaching. They typically haul 8,000 gallons in a main tank and another 5,000 gallons towed with a second "pup trailer." "I know it's not stopping easily in an emergency," Hand said. He said the Alaska Department of Transportation and Public Facilities responded to fears in Tazlina earlier this month, agreeing to lower the highway speed limit through the community of 300 from 65 mph to 55 mph. "Road safety concerns everyone in the community," Hand said. Matt Carr, a longtime spill responder with the Environmental Protection Agency in Alaska, said the accidents pose a huge risk to the environment and other drivers. But they represent far less than 1 percent of tanker-truck traffic. "Given the roads the truckers have to use and the conditions they transport (fuel) in, it's a testament to their skills and abilities that there have not been more," Carr said. The crashes typically occur in winter when daylight wanes and roads are slickest. Reports of injuries, including to truck drivers, are unusual. Regulators said only some of the accidents and spills receive public attention, like three recent crashes by Big State Logistics of Fairbanks. No injuries were reported, but large amounts of ultra-low sulfur diesel spilled, including Sept. 5 when a tanker trailer barreled off the road following an "equipment failure" near Birch Lake 50 miles south of Fairbanks, regulators said. The overturned tanker trailer dumped 3,571 gallons of fuel into marshland and a pond, but the fuel didn't reach the lake, according to state regulators. Six weeks later, on Oct. 21, a Big State truck lost traction about 40 miles northeast of Valdez, causing a 400-gallon spill of diesel into an inactive channel of the Tsaina River. And on Nov. 12, another Big State truck started sliding on the highway halfway between Valdez and Fairbanks, after the driver braked to avoid hunters and wildlife on the road, the state said. The trailer fishtailed and broke away from the truck thanks to a safety feature at the hitch, allowing the truck to remain on the road. Still, 276 gallons dumped into the trees and a section of frozen Paxson Lake. Officials with Big State declined to comment. Vince Kelly, who owns a sailboat charter business in Valdez, said he's trying to raise awareness about the dangers of the spills, including to the Copper River Watershed Project, a group from the region trying to protect rivers contributing to the Copper, including the Tsaina. "Nine thousand gallons of diesel fuel is a big slug of extremely toxic stuff, especially if it gets into wetlands," said Kelly, a former DEC regulator. Trucking companies are working with state and federal regulators to try to stop the crashes, officials said. Some shippers have changed the way they pay workers so drivers don't feel rushed to deliver fuel. They've also boosted insurance policies to pay for cleanups and taken steps to respond rapidly to spills, said Ashley Adamczak, DEC supervisor in the Interior unit. 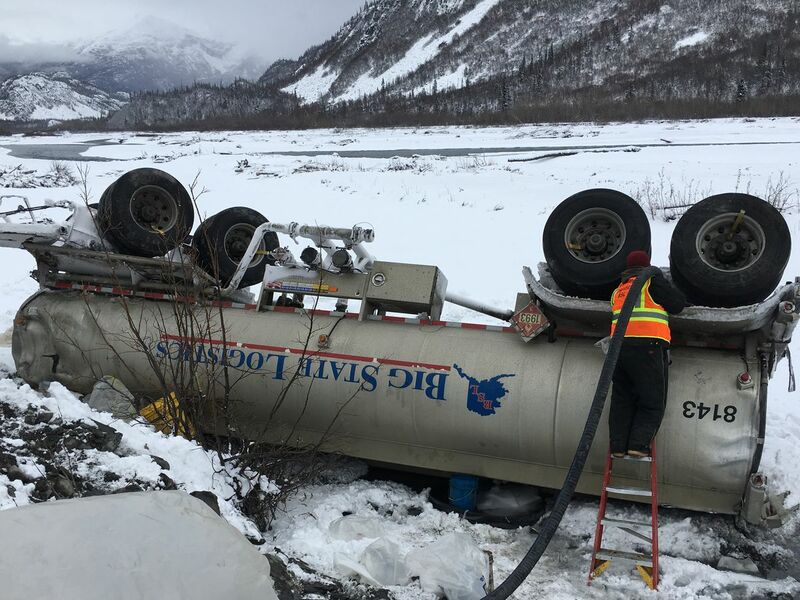 A lack of insurance was a problem in late 2014, when the state responded to a 4,400-gallon spill after a tanker truck slid off the highway about 50 miles northeast of Valdez. The accident ripped open the tank, and fuel spilled onto a frozen creek that flows into the Tiekel River, a Copper River tributary. The truck owner, Alaska Petroleum Distributing in North Pole, used up most of its $1 million insurance policy and said it was out of money, the EPA said at the time. The agency stepped in, hiring cleanup crews to finish the costly job. In December 2015, the company paid a $52,000 Clean Water Act penalty for the fuel spill, under a settlement with the EPA. Aves Thompson, executive director of the Alaska Trucking Association, said trucking companies are taking other measures, including providing multiple training runs for new drivers to familiarize them with Alaska roads before they get behind the wheel. "They want their drivers home safely at night and they don't want to damage the environment," he said. Several factors contribute to the accidents, including drivers who aren't attentive enough and periods of thawing and freezing in recent winters that have kept roads slick. Reduced road maintenance is also an issue, Thompson said. The Alaska Department of Transportation has reduced its budget by $60 million over two years, a 22 percent drop. That led to the elimination of 14 maintenance positions on the Richardson and Dalton, about a 15 percent drop. "DOT does the best they can, but they are short on funds," Thompson said. Meadow Bailey, a DOT spokeswoman, said the agency's reductions in road work are relatively small on high-priority roads, including the Richardson and Dalton. With so many factors contributing to the tanker-truck accidents, it is incorrect to blame the accidents on the staff reductions, she said. But she added there's no staff on roads at night in some locations and responses to big storms are slower. "We just don't have as many operators available to service roads," she said.